Aio is the range that has won the most awards in Methven’s 131 year history; the range has a total of 23 national and international awards. Doesn't halo-shaped showerhead just look so cool? 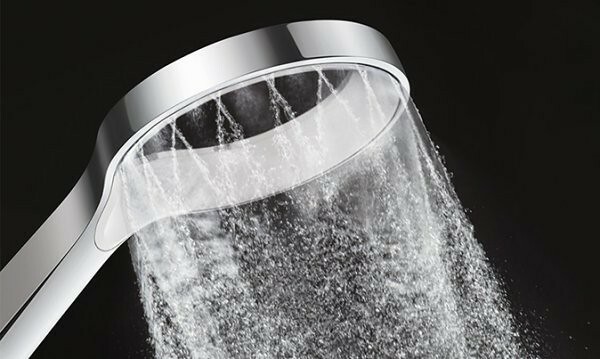 But beyond aesthetics, the circular showerhead uses hidden nozzles to generate individual jets of water that collide at precise angles to produce a wide, even shower spray pattern with enhanced droplet density without gaps. This gives you up to 20% more total spray force and double the water coverage on the skin than conventional showers, yet uses as little as nine litres of water per minute. I had the opportunity to try out the Aurajet at home, and it is a blissful change! The water pressure is actually quite gentle, so you don't have to be afraid of your face being pummeled by strong jets. From a high enough spot, it resembles a rainshower; the droplets are plentiful enough to create the sensation of a light rain cascading down. You're completely covered without having to move or adjust your position. The Aurajet comes in various colours (not all available here) but I still think the chrome/silver is the best. 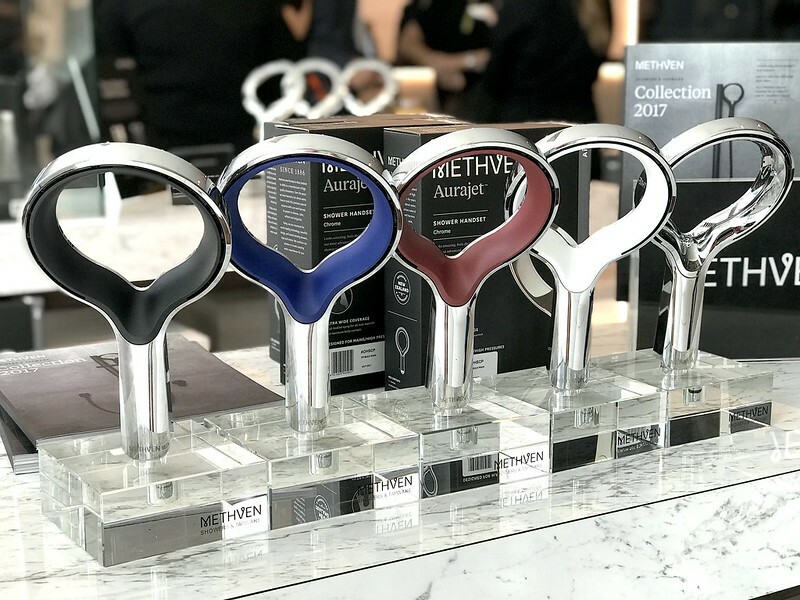 Methven Chief Executive Mr David Banfield signed agreements with Bacera Pte Ltd, Uniquos Pte Ltd and VolumeFive Pte Ltd, with each distributor targeting different market segments. 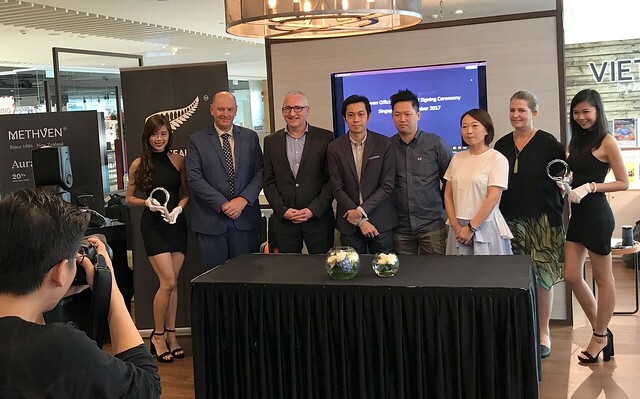 New Zealand’s High Commissioner to Singapore, Dr Jonathan Austin and Regional Director of New Zealand High Commission for East Asia, Ms Clare Wilson, witnessed the signing ceremony in Singapore. Dr Austin himself said he would only use Methven in his own home. 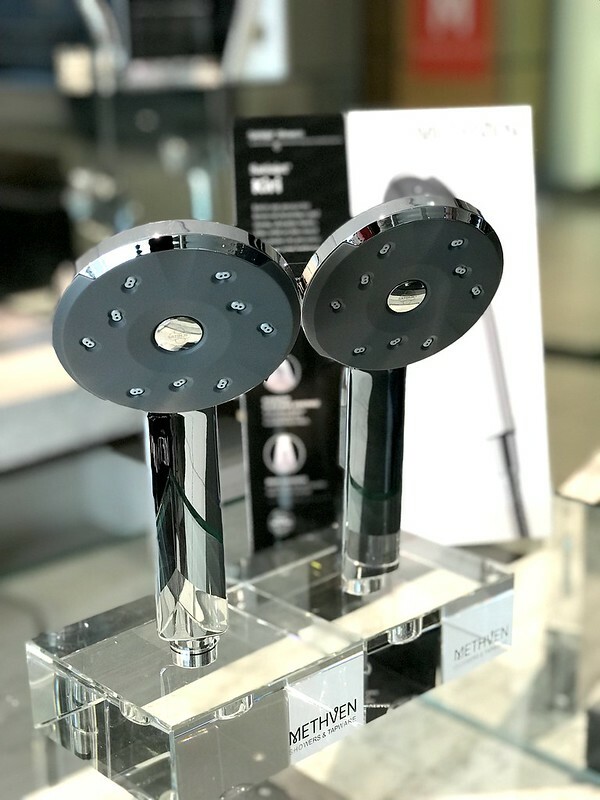 At the Singapore launch, they also introduced the Kiri Low-Flow showerhead using Satinjet® technology that has achieved the WELS (Water Efficiency Labelling Scheme) Three-Star rating on mains pressure (5.0L per min flow rate), spray force and spray coverage — with reference AS 3662-2013, Standards Australia, for performance of showers for bathing. I heard this is even more gentle and is also one of the most popular models. 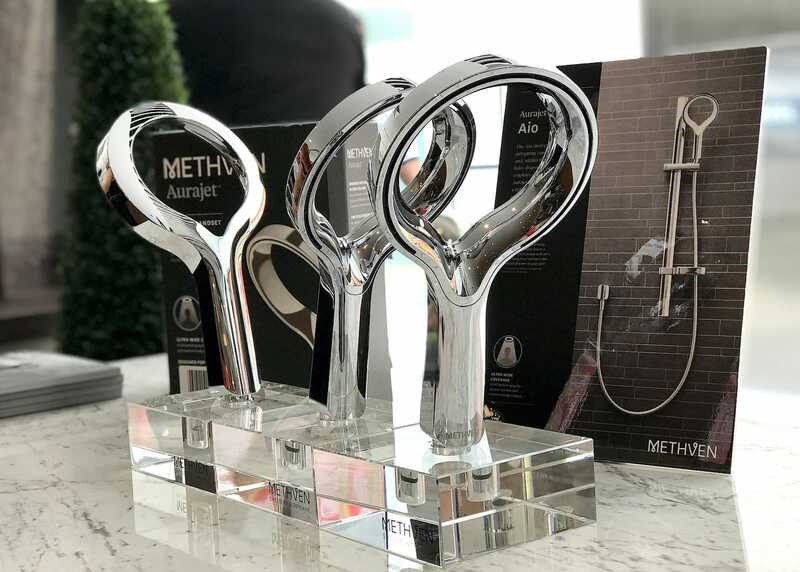 Selected models of Methven showerheads are currently available at Bacera and Uniquos’ website from 6 November 2017; while VolumeFive Pte Ltd will be undertaking development projects for Methven showerheads and tapware. The Methven Aio Aurajet is going for a promo price of S$239.00 (U.P: S$282.00). Many thanks to Methven for the review unit.